(Bloomberg) -- Short sales of Wirecard AG stock are set to resume as a regulatory ban expires on April 18, and some indicators suggest that pressure on the digital-payment company’s shares remains high. Positions that benefit from a stock decline amount to 14 percent of Wirecard’s freely traded shares, according to data compiled by IHS Markit. That’s the highest proportion for companies on Germany’s benchmark DAX Index, with the figure for members of the gauge averaging 2 percent, and it hasn’t fallen since shorting transactions were halted. Financial-market watchdog Bafin imposed the unusual short-sale ban in February, and hasn’t yet decided whether to prolong it. 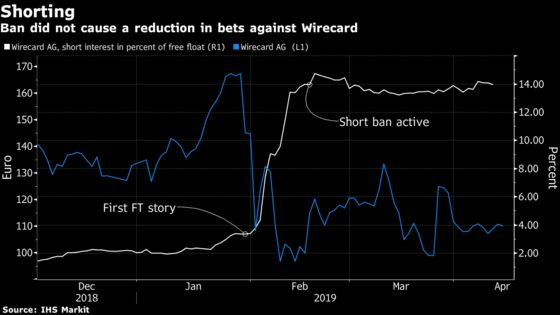 The high proportion of stock-drop bets on Wirecard suggests investors aren’t convinced by the company’s declaration that findings from an outside probe into accounting issues in Singapore would only have a marginal impact on financial figures. Wirecard stock has been volatile since reports emerged in the Financial Times in January questioning the Singapore operations, often jumping or plunging by a double-digit percentage throughout the trading session. The shares are currently 4.2 percent below their closing level the day that the German short-selling ban took effect and about 34 percent down from the price just prior to the first Financial Times report. The short ban caused outrage among market participants, mainly hedge funds and short sellers. British hedge fund titan Crispin Odey said in February that the German regulator has opened the door to a potential lawsuit. A Frankfurt court on Friday rejected an emergency lawsuit by an investor challenging the ban.